For binary betting today, last night US markets dipped, and European equities are down this morning. However, losses are small with the FTSE, CAC and DAX down by less than 0.2% overall. Yesterday the FTSE hit a new 12 month high of 5173, just 27 points shy of the 5,200 level. At 5190, the FTSE will have risen by an impressive 50% from the lows of March. This is an important level for many technical analysts so if a pull back or a pause were to come, the 5190 might be the place it would start. Today is a quiet day on the economic news front with the standout announcement being UK Public Sector Net borrowing at 08.30 GMT. There are some big moves in the markets already this morning with the pound being hit hard in early trading. Binary betting traders seem to be taking a dim view about the state of the UK government finances ahead of the UK public sector borrowing figures. The pound is down 0.85% against the GBP/USD and 0.5% against the yen and euro. The pound is not alone in falling today with the commodity pairs of the Australian and Canadian dollar both falling 0.5% against the US dollar. 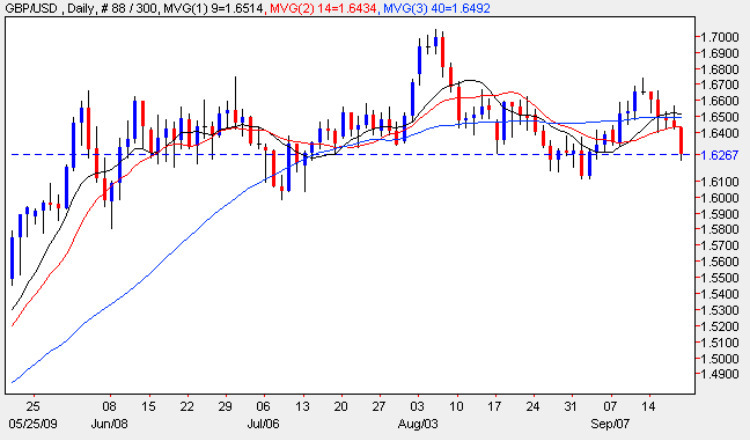 The GBP/USD has potential to go a lot further the next likely level of support around the 1.6100 level. A speculative binary betting trader could look for this level to be touched in the next three days, which returns 424%, and this is therfore my binary bet for today.